and getting no returns for your effort? How much time do you have each week for social media marketing? 1 hour a day? 3 hours a week? Now, be honest with yourself… how much time do you actually spend on social media? Do you get returns for this time? You know your unicorn clients are there somewhere, but you’re also sure that the effort you’ve put in trying to find them, could be used to fulfil your clients’ orders and keep creating instead. As a fellow creative rebel, I know how easy it is to get stuck in the social rut. You’ve jumped on every trend and signed up for every platform imaginable. You’ve put in the time and effort trying to figure out how to optimise and schedule posts your followers will love, but all it’s doing is sucking your creative energy. You’re burnt out. Don’t worry – I’ve been there too. You need smart social media services and full-proof strategy. With the right social media services and a clever marketing strategy, you’ll understand your rebel brand’s tone of voice and define what you want to say (and how). You’ll start creating content that’s always relevant and interesting to those elusive unicorn clients (and bring them out from their hiding places). I’ll show you how to weave your own content (content you own), with your earned content (earned reactions, engagements, likes, retweets) and establish a paid content strategy (such as FB advertising) that works with your budget. *I have limited capacity for Full Social Media Management and Facebook Ads can only offer this to select brands at different times due to current workload. Unsure where to start? Why not download my Unique Selling Proposition (USP) template? If you want to increase your social media ROI (return on investment) and get smart about what you share, how you share it, and what you shouldn’t be sharing, I can help. By the end of our time together you’ll know the difference between owned content, earned content and paid content. You’ll know what stats should you pay attention to, and how to benchmark and increase those important to your brand. 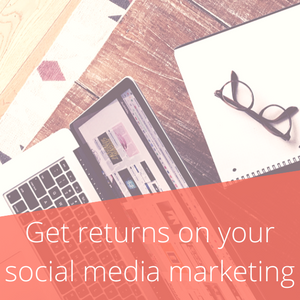 Stop wasting time using trial and error and get a return on your social media marketing now.